The Historic Lincoln Theatre in a town near mine advertised a new musical version of Romeo and Juliet, and I needed little convincing. My parents and I drove down for one of the last productions. The theatre is beautiful, an old movie house with ornately painted walls, a small lobby and an “art bar” in an adjoining alcove. An orchestra was seated at audience level off to one side of the stage. The music was well performed, and as far as design, it was often a benefit to the play, and sometimes not. The group scenes were fun with the addition of song and dance (the choreography was quite good, playing up the bawdy bits). There were definitely times as well when Shakespeare’s script would have been better spoken than sung – the musical format a little bit forced, you know. Especially in his back-and-forth dialog, his repartee, Shakespeare is pretty near perfect on his own, and those lines should have been left alone. So for the music, a mixed score; but honestly, you’d have to do a lot more than this to mess up Shakespeare, so my criticisms are slight and good-natured; it was great fun to see. A bigger problem was what I’ll call technical difficulties: our seats were in the second row, with the orchestra curling up along one side of us and the players right in front. They had microphones, but the speakers were behind us. The balance between instrumental music and actors’ voices was badly off: we often couldn’t hear what they were saying or singing at all. (Luckily we know the play well, and the acting makes much clear.) At intermission halfway through we moved well back in the theatre, and the sound quality was so drastically improved – quite good now! – that I’m only sorry we waited that long. We partly missed the balcony scene in that first half. Once the sound issues were resolved by our reseating, I have little to nitpick. The acting was quite good. Mercutio was outstanding; Juliet’s nurse was great fun; and Romeo and Juliet themselves were, as one would hope, the stars of the show. 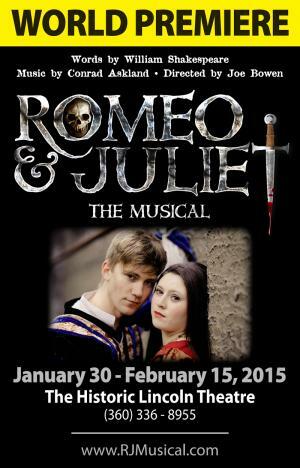 The actors represented a wide age range, which is again as it should be: Juliet was played by a senior in high school, and though Romeo is listed as a college graduate, he felt plenty youthful for his role. Tybalt is a mere child at 14! But a pretty burly 14, and pulled off the impetuosity required. While Juliet was wonderful – and a fine singer, once I could hear her – I admit Romeo was my favorite actor. He was handsome, dreamy-eyed, romantic and passionate; it was just right. This play (and so much of Shakespeare) stands the test of time. It was written more than 400 years ago, and I’ve seen it repeatedly, but it’s still so fresh and affecting: every time I ache for Romeo to wait just a little bit longer, for Juliet to wake up in time, for Tybalt to listen to Romeo’s pleas, for Mercutio to recover. And although I had considered myself a little too jaded for this, I admit the romance got to me again, and clearly will the next time I see this play performed. It’s just too good. Shakespeare has his audience wrapped up; the romance and the tragedy are every bit as alive in 2015 as when he wrote these lines in the 1590’s. There is comedy here, too. I don’t know the histories so well and so won’t comment; but even in his tragedies there is bawdy, physical humor or wordplay. Different interpretations can play these lines up more or less; this one inserted a few pelvic thrusts to good comedic effect. I don’t want to be too harsh on the musical adaptation; it was often fine and only occasionally the merest bit heavy-handed, but the play as presented by talented actors was outrageously fun and moving and I’d see it again. But I’d sit further back. Rating: 9 vials for Shakespeare, 8 for the production, 7 for sound.